Classic succotash is usually a mix of corn, peppers and lima beans. In her new cookbook The Healthy Slow Cooker: 135 Gluten-Free Recipes for Health and Wellness , Judith Finlayson switches it up a bit with great results. 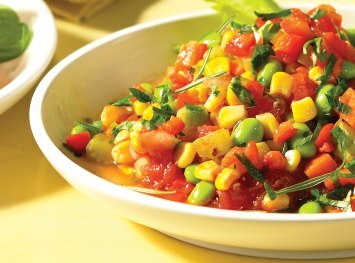 This succotash recipe suits a medium to large (3 1/2 to 5 quart) slow cooker. In a skillet, heat the oil over medium heat. Add the onions, celery and carrots and cook, stirring, until softened, about 7 minutes. Add the garlic, rosemary, salt and peppercorns and cook, stirring, for 1 minute. Stir in the tomatoes with the juice and vegetable stock and bring to a boil. Transfer to your slow cooker stoneware. Add edamame and stir well. Cover and cook on Low for 8 hours or on High for 4 hours, until the mixture is hot and bubbly. Stir in the paprika solution. Add the corn, roasted red peppers and parsley and stir well. Cover and cook on High for 15 minutes, until the corn is tender and the mixture is heated through. If you cutting this recipe in half, be sure to use a small (1 1/2 to 3 1/2 quart) slow cooker. Make sure your edamame are organically grown. Most of the soybeans grown in North America are genetically modified. This recipe can easily be halved if you prefer to make a smaller amount. Note the tip above about using a smaller slow cooker. 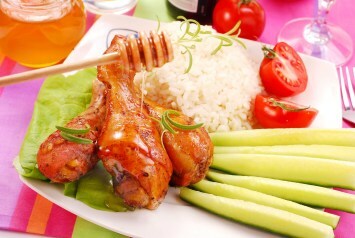 This is an extremely healthy recipe – great for vegetarians and the meat eaters among us. If you are not familiar with edamame, they are basically immature soybeans. They are often sold still in the pods, which are steamed and served topped with a bit of salt. Really good and very good for you. Edamame beans are a big part of Japanese cuisine, which is the country we most often associate them with, but they are also found in the cuisines of China, Hawaii and Indonesia. Have a look at the nutrient content in this recipe (in the blue box above). This is a VERY healthy recipe that is perfect for vegetarians or those needing to eat gluten free recipes. If you like this succotash recipe, read our review of Judith’s healthy slow cooker cookbook here. This recipe is provided courtesy of The Healthy Slow Cooker, Second Edition by Judith Finlayson © 2014 www.robertrose.ca Reprinted with publisher permission.